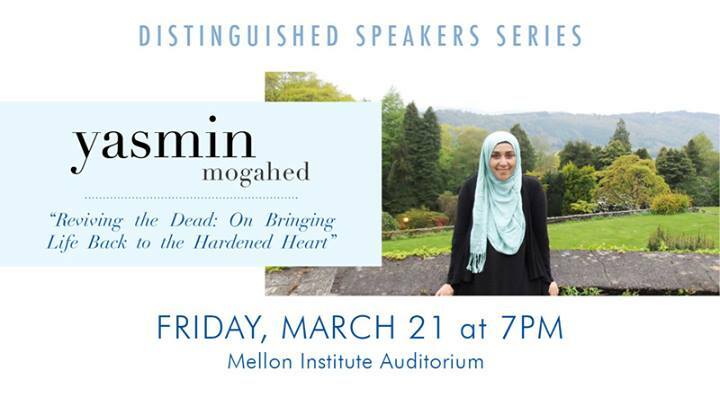 The Islamic Center of Pittsburgh (ICP), in collaboration with the Muslim Students Association, is proud to debut its Distinguished Speaker Series with Ustadha Yasmin Mogahed. Yasmin Mogahed is currently an instructor for AlMaghrib Institute, a writer for the Huffington Post, an international speaker, and author, where she focuses most of her work on spiritual and personal development. Yasmin recently released her new book, Reclaim Your Heart, which is now available worldwide. Visit her website, yasminmogahed.com, where you can read more about her and find a collection of her articles, poetry, and lectures. The event will be held on March 21, 2014 at 7pm at the Mellon Institute Auditorium on 4400 5th Avenue in Pittsburgh, Pennsylvania. Refreshments will be served at 6:15pm, and the talk will begin promptly at 7pm. Ustadha Yasmin Mogahed has graciously agreed to do a book-signing of Reclaim Your Heart after the event. Books will be available for sale at the event for $20 (cash or check only), or you can purchase it in advance on AmazonSmile and have a portion of your payment go to The Islamic Center of Pittsburgh. Admission will be $25 for the general public, $20 for ICP Members, and $10 for students. Platinum Members will be admitted free of charge. All other ICP Members must submit their Membership ID number (sent via email) when purchasing tickets, and students must show a valid student ID. Payment: Payment for tickets can be made in advance online or in the main office at the ICP by cash, check, or credit card. Tickets will also be available for purchase the day of the event at the venue. Pickup: Tickets will be available for Will Call at the event or can be mailed. You may also pick up your tickets in advance in the main office at the ICP. Our offices are located on the Parkman Avenue entrance of the building, and our office hours are Monday to Friday, 9AM to 3PM. As a complimentary service, Platinum Members will receive their tickets in the mail and do not need to purchase their ticket in advance. For any questions or concerns, please contact us at ec@icp-pgh.org, or 412-682-5555.